BRP Hot Rods: MG9 high-torque TR-6060 Trans Mount Adapter BRP Hot Rods.com - conversion kit specialists for GM vehicles. This adapter bracket is for the MG9 �high-torque� version of the TR-6060 behind the LSA engines in the CTS-V and ZL1 Camaro. 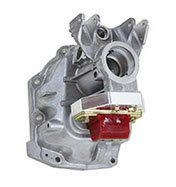 It's CNC machined from 6061-T6 billet aluminum and has a milled finish.